The Holiday Season causes some minor upheaval in the flow of information from Cape May, as people head off to reunite themselves with family and friends. But the birds carried on regardless and ensured some happy times in the field over the past two weeks. Having been away during this period, I returned to a stack of emails (now mostly worked through!) and amongst them were a few photos which I've posted here. As of today, the male King Eider remains at Avalon and the Bell's Vireo is present but elusive still, by the entrance gate to The Beanery. Today's big new arrival was an immature White Ibis reported by Glen Davis which showed up on Lake Lily, along with a Great Egret and a Great Blue Heron. This is a real oddball bird to turn up in late December but a nice end of year present for those lucky enough to see it. The bird flew off NW around 2:15PM but may well show up again at some point. 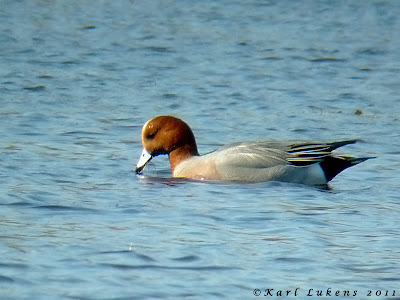 Lake Lily down here at Cape May Point holds a great array of ducks at present (including Redhead and Eurasian Wigeon) and is certainly worth a visit. Other birds this past few days include a Dovekie at Atlantic City beachfront on 27th and another which flew into Hereford Inlet (between Stone Harbor and North Wildwood) on 28th. 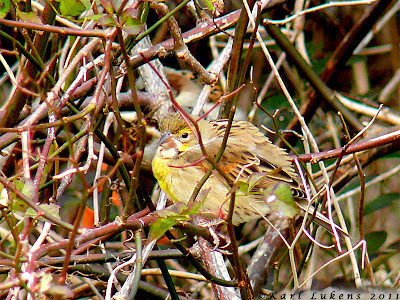 A Dickcissel has been hanging out with House Sparrows at 105 Harvard Avenue at Cape May Point for several days now and two Baltimore Orioles were at the Hawkwatch on 28th. 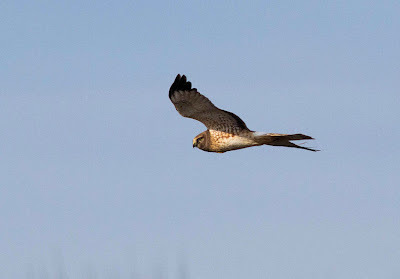 A Glossy Ibis and up to four or five Blue-winged Teal continue to hang on at the point and Tom Reed reported two Rough-legged Hawks at Tuckahoe WMA today. White Ibis on the island in Lake Lily today. 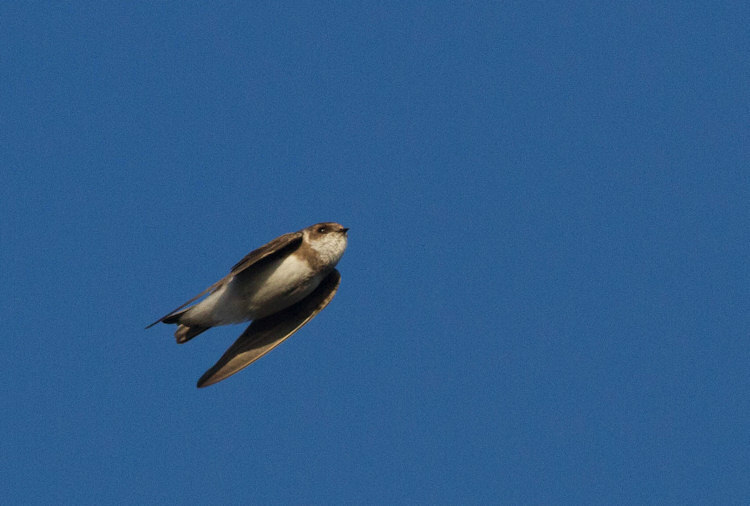 The bird flew off towards Pond Creek Marsh early afternoon but may still be in the area [photo by Mike Crewe]. This Dickcissel continues to lurk in rose bushes along Harvard Avenue, just behind the dune in Cape May Point [photo by Karl Lukens]. 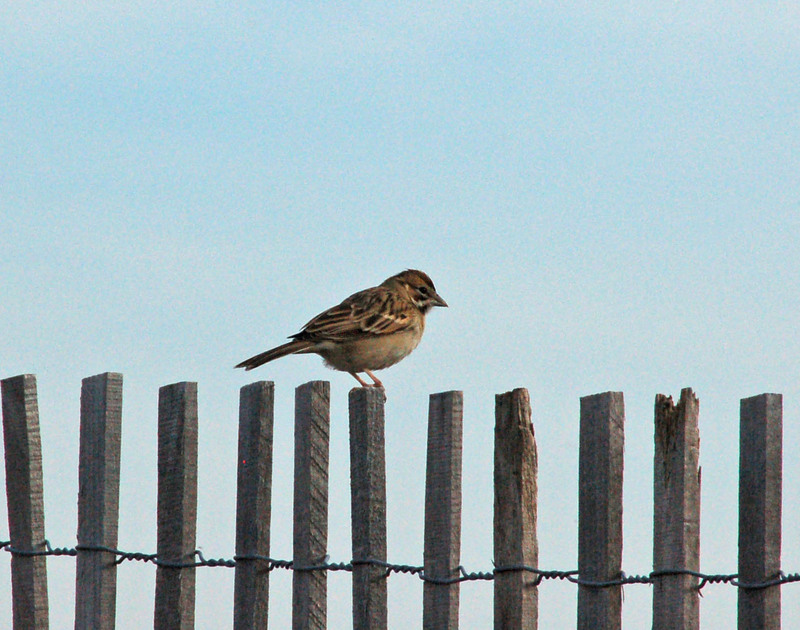 Jimmy Dowdell and Clay Sutton found this Lark Sparrow at Ocean City, at the end of Seaview Road, on December 22nd [photo by Pat Sutton]. 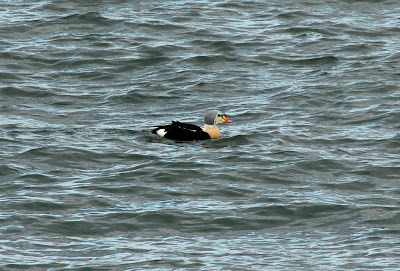 Avalon's King Eider is putting on a good show for its admirers [photo by Pat Sutton]. The spectacular adult male King Eider continues in the mixed eider/scoter flock at the Seawatch at Avalon, being seen this morning between the Seawatch and the inlet by Vince Elia. Yesterday, it put on a great show, providing incredible looks right in front of Seawatch. The flock of ducks with which it is associating is dominated by Common Eiders, which number nearly 80 (I counted 71 yesterday, Don Freiday counted ~80 the day before). As the flock is often close, it provides enjoyable opportunities to practice ageing and sexing of the various species, with the Common Eiders being most interesting in that regard (at least, in my opinion). Yesterday, I noted a female Common Eider that was much grayer and more-strongly marked than most or all of the others, so was wondering about a different subspecies (dresseri, breeding from n. Quebec to Maine, is the regular form here; borealis from farther north, breeding from e. Nunavut east to Labrador, is the next best option). Unfortunately, my camera decided not to work, so I got no pictures and hadn't, yet, figured out how to separate them. 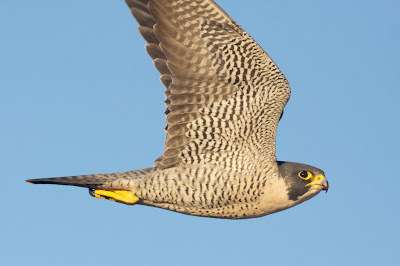 Others may want to work on that; The Sibley Guide provides some good pointers, with his 'Atlantic' birds being dresseri and his 'East Arctic' form being borealis. Note overall color differences and the extent of the bill lobes and eye placement. Keep in mind that even in dresseri, adult and breeding-season females are grayer than juvenile and non-breeding females -- generally. Unlike previous years when scoters dominated the Avalon wintering flock, the number of scoters this winter is very low, with no White-winged Scoters. Yesterday, I counted just 24 Surf Scoters and five Black Scoters (though I did see flocks of Blacks flying by). A male Long-tailed Duck with the flock (the only one with the flock then) had a neck that was nearly all blackish -- already well on its way in changing plumage to the one that male Long-taileds wear in spring. 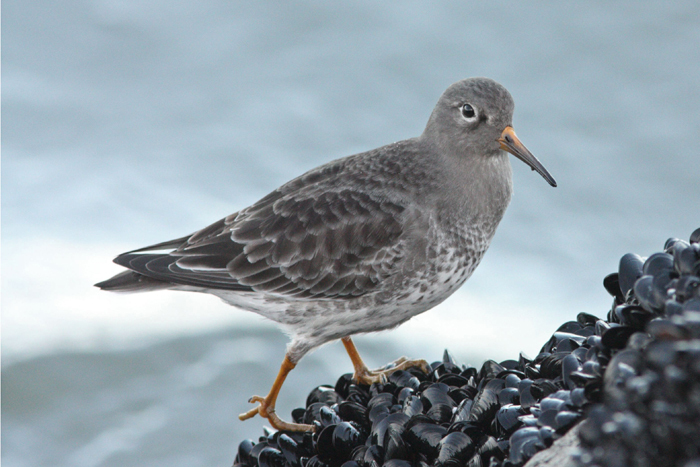 Finally, I counted five Purple Sandpipers on the jetty in front of the Seawatch. Speaking of Seawatch, itself, the season's count ended -- as per usual -- on 22 December, so you're on your own there, until the start of next year's waterbird count on 22 September. Jim Dowdell has been tracking the occurrence of a juvenile Great Cormorant that has been loafing and roosting at a most unusual location: Lake Champlain in southern Villas (Champlain Dr. east of Bay Dr.). He has seen the bird most times that he has visited the site since late October, though I hadn't seen it either of the two times that I'd visited, once each in November and December. 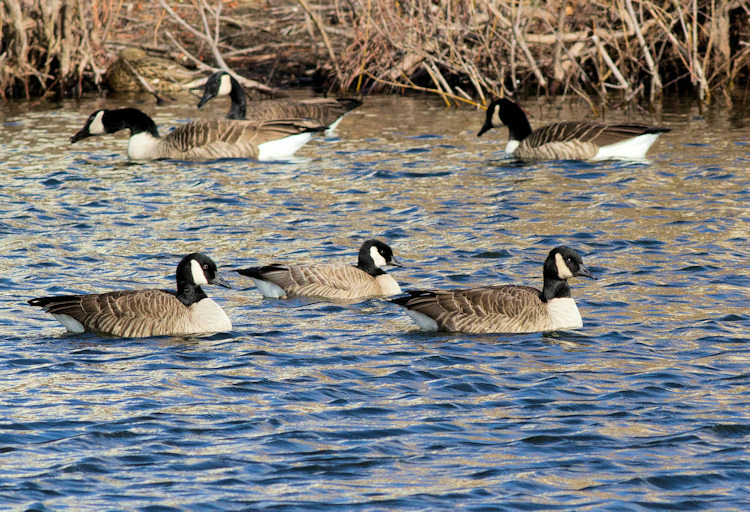 This morning, Jim called to say that it was there, along with a Cackling Goose, which made Jim's first record of the species there in the 16 or so years that he's been visiting the site. I bopped on down and, lo and behold, both birds were still there, along with some 16 Hooded Mergansers and a variety of other waterbirds. 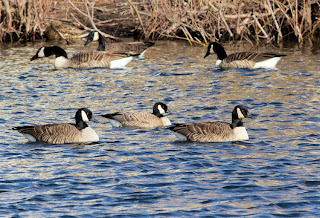 The Cackling Goose was almost certainly the same bird as has been noted a few times recently just a flap or two away at the Cox Hall Creek WMA. 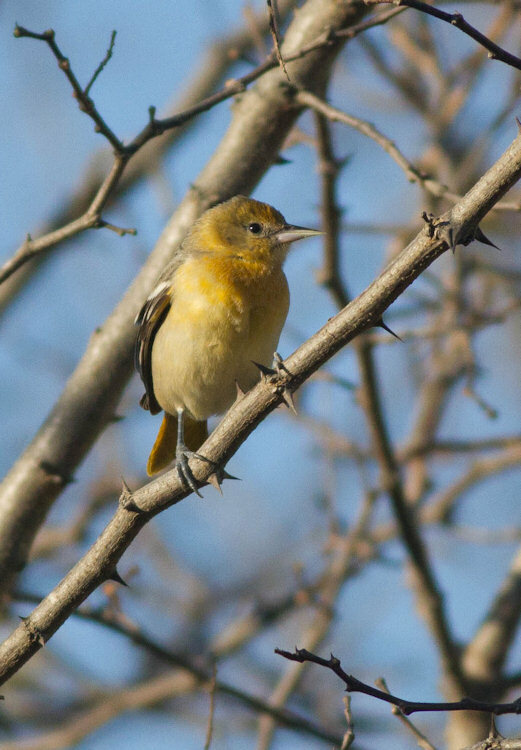 For many birders in the New World, the event of the year is the Christmas Bird Count, a program run since 1900 by the National Audubon Society and conducted these days in local 15 mile-diameter circles between 14 December and 5 January, inclusive. 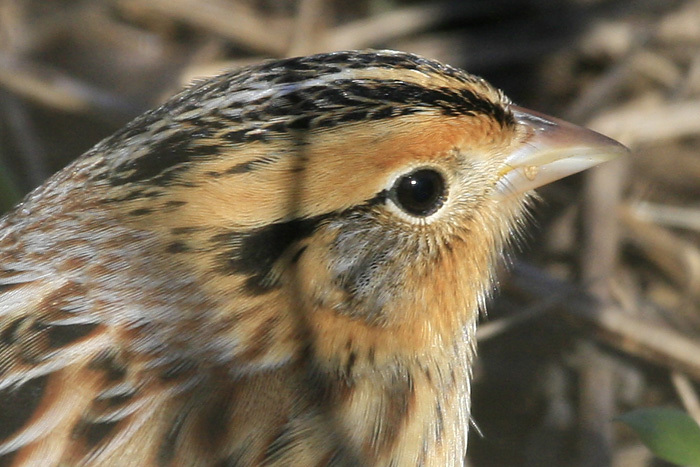 Due to extensive and intensive effort to find and count birds during the CBC season, a large number of rarities are turned up, continent-wide, as a result. What would this year's Cape May count uncover? 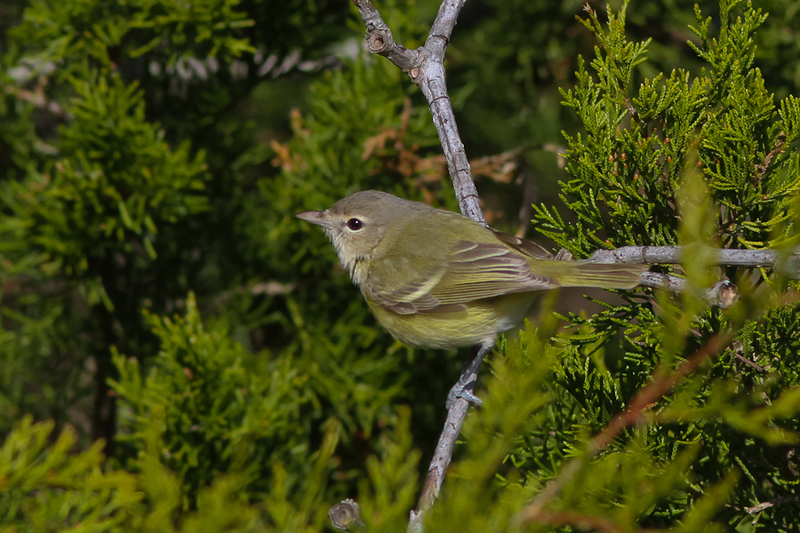 With no significant cold spells this fall and early winter in Cape May, there were high hopes for a high count, with visions of barely-hardy warblers and other wee beasties to get the blood racing. 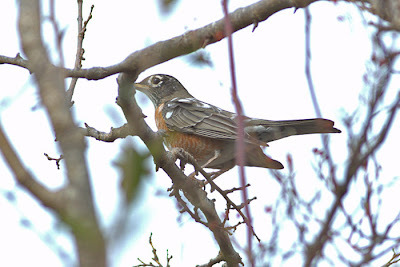 In the days leading up to the count, conducted 18 December, a goodly number of interesting/locally rare birds were found or noted as continuing (e.g., Redheads in a couple places, the Cape May Point White-winged Dove, the Cape Island Preserve Ash-throated Flycatcher, and the Beanery Bell's Vireo). Unfortunately, the White-winged Dove and Ash-throated Flycatcher went missing even before count week (three days on either side of count day), but the Redheads and Bell's Vireo stayed put to be tallied. What was probably the best among individual birds found on count day (that is, not known to be present previously) was the Western Kingbird seen well in flight at the Coral Ave. crossover on Cape May Point by Glen Davis. Unfortunately, it apparently kept going and was not seen again. A bird heard calling at the Cape May Migratory Bird Refuge (aka 'The Meadows') that may have been a King Rail was reported by Rick Mellon and company. As far as I know, the final verdict on that remains up in the air. A Common Merganser was a good find on Lily Lake. A hummingbird seen four times by Melissa Roach and Tom Johnson, but exceedingly briefly each time, went unidentified in the town of Cape May. There were no other unexpected surprises (if that's not too redundant of a term) and the tally included only four species of warbler (Orange-crowned - which were more numerous than usual, Yellow-rumped, Pine, and Palm. The number of staked-out goodies bagged for the count were many and varied and included: Cackling Goose, Eurasian Wigeon, a Plegadis ibis of uncertain species, Osprey,Eurasian Collared-Dove, Rufous Hummingbird, Red-headed Woodpecker, and the aforementioned Bell's Vireo. However, a number of species were notable by their absence on the count: Tricolored Heron, Semipalmated Plover, Willet, Least Sandpiper, Laughing Gull, Eastern Phoebe, Horned Lark, Common Yellowthroat, White-crowned Sparrow, Snow Bunting, Purple Finch, and Pine Siskin. Considering the large number of lingering Great Egrets counted, the lack of a Tricolored Heron in any of the extensive back bays seems incredibly odd, as the species is not all that rare here in winter. And given the benign fall, the lack of Eastern Phoebes -- a species that is present here in even atrocious winters -- is doubly odd. So, the day ended with a fairly average count of 151 species. Still, that total will be one of only two count totals exceeding 150 species north of 38 degrees N latitude and away from the West Coast, and the other is south of us (Ocean City, MD). As per usual in an area as well birded as Cape May, the list of count-week species -- those found within the period on three days either side of the count, but not on count day -- is long: Laughing Gull, Common Tern, Tree Swallow, House Wren, Common Yellowthroat, Dickcissel, and White-winged Crossbill are the ones that come to mind at the moment. Ah, perhaps next year we'll get back over 160! 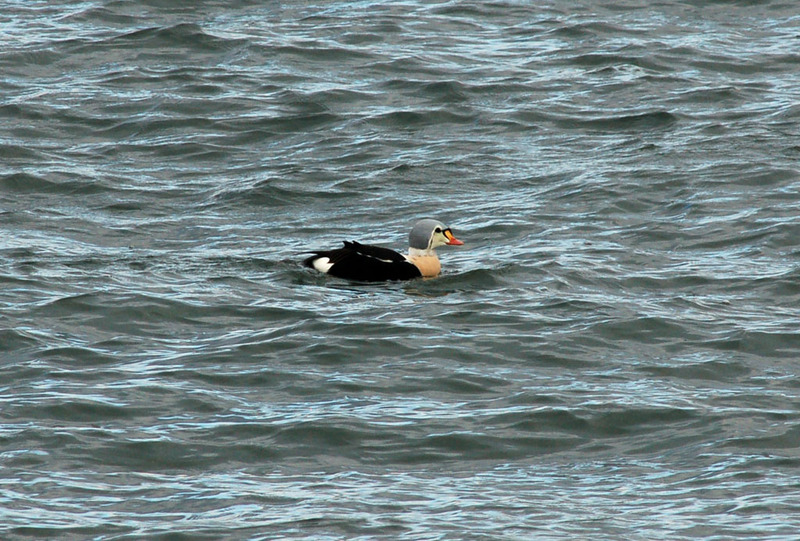 The main attraction is currently a King Eider that joined the seaduck flock at the Avalon Seawatch on Thursday. It was still being seen this morning, and as the photo below demonstrates, it is truly worth going to see! [King Eider (left) and Common Eider in front of the Avalon Seawatch on Thursday. Also at the Seawatch on Thursday was a fly-by Black Guillemot, quite possibly the same individual seen flying south along New Jersey's north shore the afternoon before. That bird hasn't been seen again. Other Seawatch sightings included another handful of Razorbills, a couple Red-necked Grebes and a few Black-legged Kittiwakes- not a bad way to end the season! 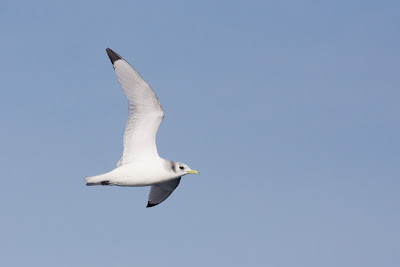 Speaking of Kittiwakes, a few have also been seen recently from Cape May Point. 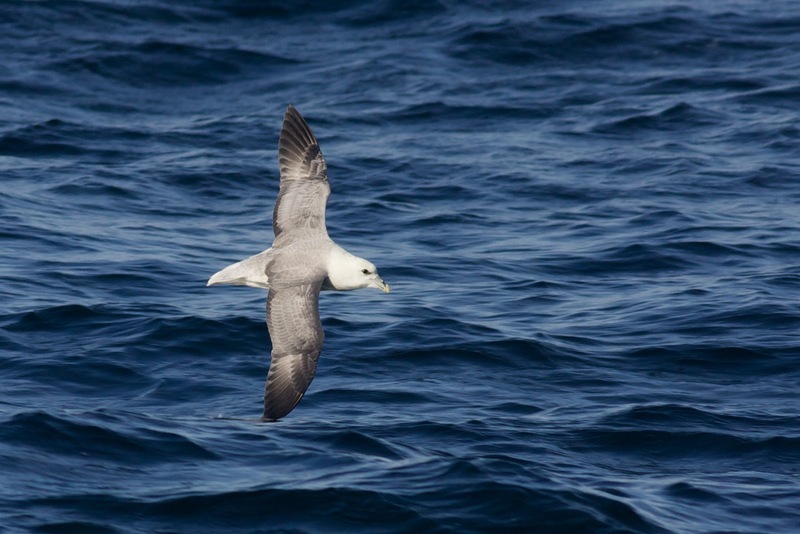 The past month has provided a surprisingly high number of Kittiwake sightings from shore, and it will be interesting to see if the trend continues into the new year. The Cape May Christmas Bird Count was held last Sunday, and as always, it provided a number of highlights. Among these were the Beanery's Bell's Vireo (which hasn't been reported in the past few days), an unidentified hummingbird in Cape May, a lingering Glossy Ibis on Cape Island, the continuing Eurasian Wigeon(s) on the Point ponds, several Orange-crowned Warblers, Marbled Godwits at Stone Harbor Point, and a few other birds I'm sure I've forgotten. Other recent goodies included a Lark Sparrow on Thursday, found by Jim Dowdell at the end of Seaview Road in Ocean City; continuing Cackling Goose and Red-headed Woodpecker at Villas/Cox Hall Creek WMA; and a handful of lingering Palm Warblers at the Beanery as of yesterday. We wish you and yours a very Merry Christmas and Happy Holidays! You know what birding is like; you get up in the morning and you never quite know what is going to happen - that's what elevates birding above plane spotting (no offence to plane spotters but, you know, if you have a timetable you pretty much know what you're gonna see that day!!). This morning was just like any other December morning when it started - until two kind birders strolled into the Northwood Center and revealed that they had just refound the Bell's Vireo! Yes, the Bell's Vireo, that had been right at the entrance gate to The Beanery for just one day - December 3rd - and hadn't been seen since! Surely not? Surely it can't have been lurking there all this time ... unseen ...well, it seems that it can!! I gave it a good shot on an early lunch break - an hour at the gate and no sign. Plenty of other stuff; both Ruby-crowned and Golden-crowned Kinglets, Winter Wren, Yellow-rumped Warbler, Northern Flicker (all good fodder for the forthcoming Christmas Bird Count this weekend), but no vireo. 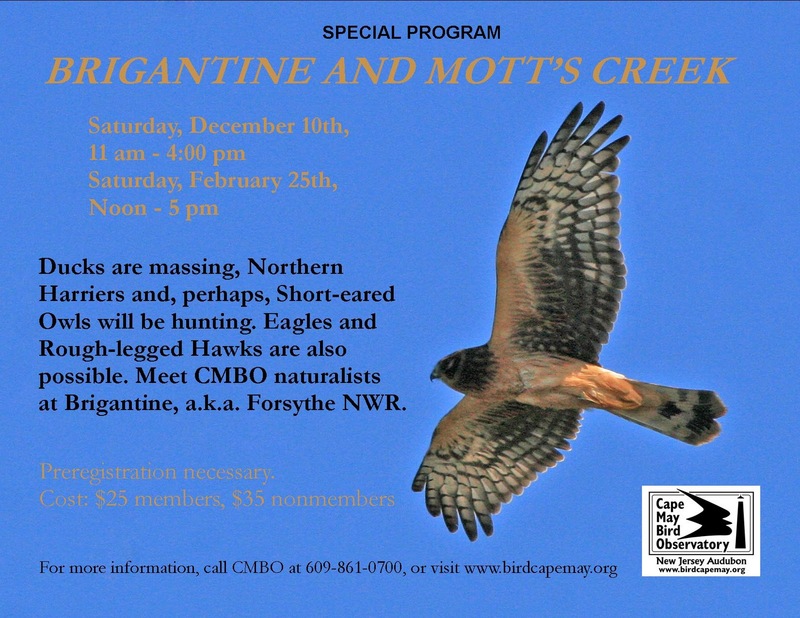 I missed it before as its appearance coincided with our annual trip up to Barnegat Light for the wonderful Harlequin Ducks. Now I was missing it again. After an hour I left Karl Lukens who spent another 30 minutes there, still with no luck. But then Glen Davies gave it a shot and the message was out - Bell's Vireo at the gate and showing well!! 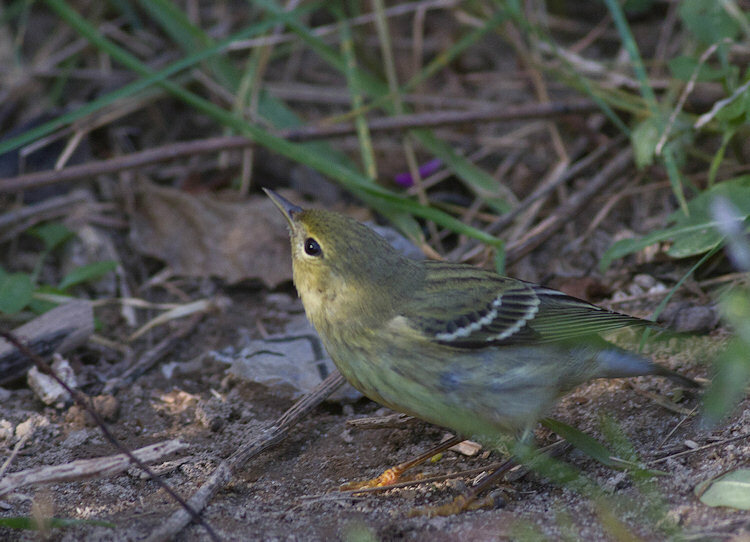 It seems that the Bell's Vireo likes to spend a lot of time feeding low amongst dense vegetation, so do bear this in mind if you come looking for the bird. Today it spent a fair amount of time hunting insects on the ground or very low amongst stands of Common Reed stems, just west of the entrance gate at The Beanery, on the north side of the first field, but also ventured east of Bayshore Road on the hedgeline that runs along the old railroad track. Please be aware that this is private farmland on the east side of Bayshore Road. Time has flown by and it's been a few days since I posted latest news, but December can be a little quiet of course. As is to be expected, the keen eyes of Tom Reed have been turning up the goods at the Avalon Seawatch and it's certainly been a good season so far for Razorbill sightings with small numbers seen on several dates of the past few days. Both Little and Black-headed Gulls have been seen, but perhaps the highlight has been a Humpback Whale which has been feeding and hanging out off Avalon for several days to December 12th at least. 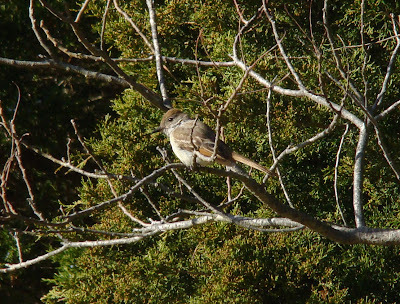 The Ash-throated Flycatcher was last reported on December 10th, when it seemed to be ranging even more widely and had moved on to nearby private land. The three Eurasian Collared Doves continue to hang out in the vicinity of Whilldin Avenue and the White-winged Dove was reported again today (14th) after a brief disappearing act and is currently being seen on Stites Avenue. A little further afield, Dave Lord reported the resident Sandhill Crane flock at Husted's Landing on 11th and two Tricolored Herons were noted at Barnegat Bay on 10th. On a very different topic, this apparent Trumpeter Swan has been causing consternation it seems since at least late November at Brigantine. This species has a checkered history on the East coast; on the face of it, a true vagrant from the relatively small and threatened wild population that breeds in the north-western States and western Canada seems unlikely. Yet there are vagrancy records from many parts of the US so such an occurance should not be dismissed out of hand. 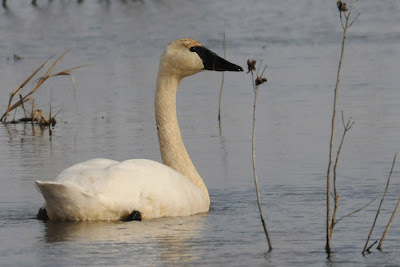 Alternatively, we have to consider the possibility both of possible escapes from captivity or even possible hybrids with Tundra Swan. There are currently no accepted records of wild Trumpeter Swans in New Jersey - so this bird is open to offers... [photo by Marvin Hyett, December 8th ]. It's been a fairly quiet few days at the back end of this week, though a stormy north-westerly on Wednesday night probably shook a few things up, as will have the white frosting on the ground that I discovered in the garden this morning. Our bird bath was frozen over for the first time this season and such temperature changes are likely to get things on the move again. The adult male Painted Bunting was not seen this morning (Friday) for the first time during its stay; it's a little early in the day to know whether it has left for certain yet, but it is a least a break in routine. We will keep you posted. I hear that the female Rufous Hummingbird is still visiting feeders up at our Goshen Center - tomorrow will make seven weeks that this bird has been around (and I still haven't seen it!!). There has been no word for a couple of days on the female south of the canal but it may still be around. 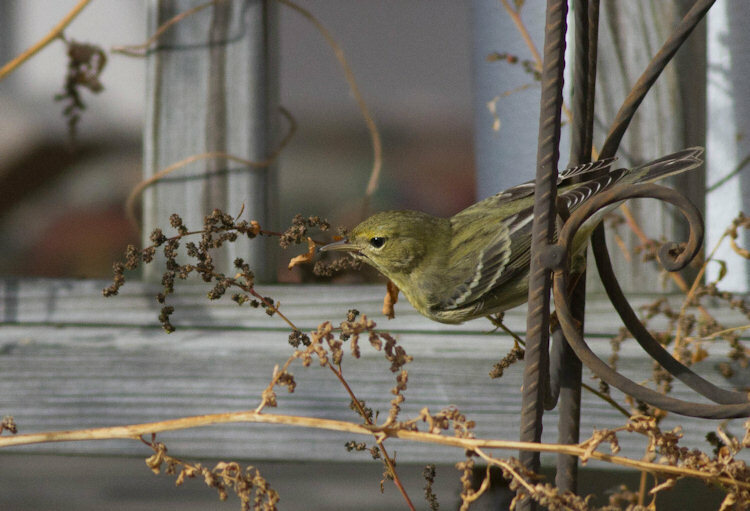 It has been seen at various feeders and red-flowered Pineapple Sage plants in gardens around the Foster Avenue/Batts Lane area and adjoining part of New England Road. At the Seawatch, Razorbills continue to be hot news with two settling on the water off 8th street this morning. A small whale reported off Avalon on 7th turned out to be a small Humpback, with a second whale seen briefly further out. 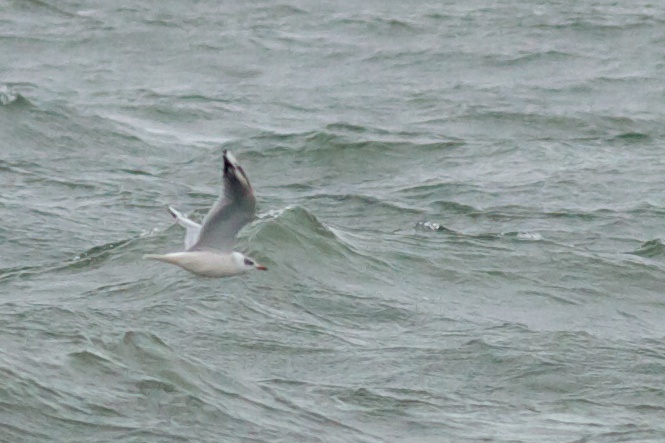 Despite poor weather conditions, several observers managed to see this animal from shore. Avalon also produced late Brown Pelican and at least three Parasitic Jaegers on 6th and a fly-by Harlequin Duck on 7th. A Dickcissel was at a backyard feeder in Del Haven on 7th and 8th at least and a very late Osprey flew over The Beanery on 8th. It seems likely that, if nothing else, this cold snap will put paid to the amazing late run of butterfly and insect records around Cape May County. Will Kerling tells me that 10 butterfly species have been recorded in the county this month and Will finally tracked down a Citrine Forktail for the month too. The butterflies recorded are: Small White, Clouded Sulphur, Orange Sulphur (by far the commonest species), Monarch, American Lady, Sachem, Fiery Skipper, Common Buckeye, Mourning Cloak, Red Admiral. I've been looking for a lull to mention reports made during the Fall of wing-tagged Great Egrets around Cape May - and finally I have that moment! 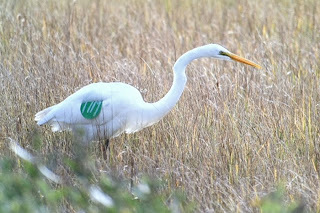 Thanks to Pam Higginbotham for alerting me to the presence of at least two wing-tagged Great Egrets, both of which appear to have been tagged at breeding grounds on Lake Huron and Georgian Bay, near the communities of Collingwood and Southampton, Ontario - north and north-west of Toronto, Canada. Bird banding has long been used as a method for collecting data from birds during their lifespan, but colored patagial tags with a series of numbers and letters are far more visible to the casual birdwatcher and thus give a greater chance of sightings being made in the field. 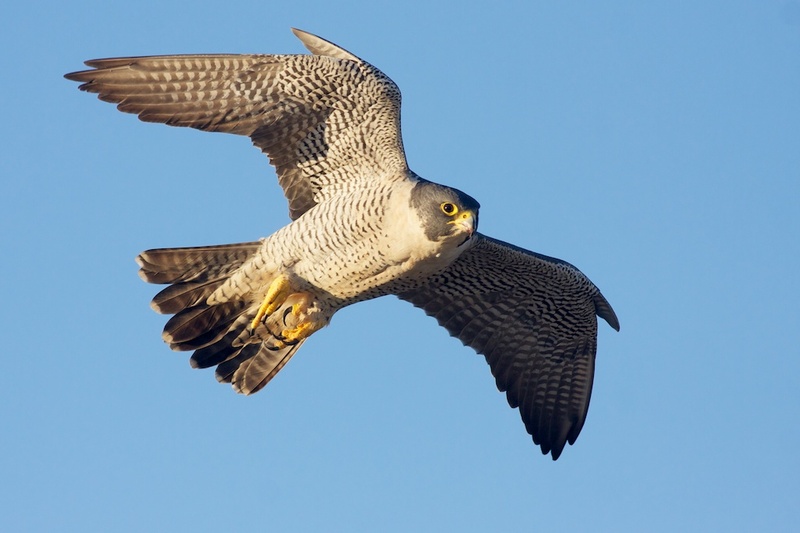 Such tags are used a lot for larger birds such as raptors and waterbirds and can give us a lot of information on movements of birds, including their migration routes and their breeding grounds. 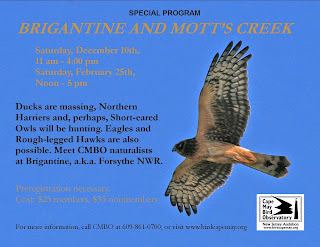 This coming Saturday, December 10th, sees the first of our two regular winter excursions to Brigantine (or the Edwin B. Forsythe National Wildlife Refuge (Brigantine Division) if you want its full name!). This is a full day birding excursion and - as usual - promises to be a great day out. 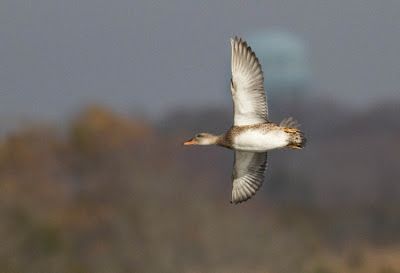 Brigantine hosts large numbers of Black Ducks, Snow Geese and a whole host of other waterfowl during the winter and never fails to provide some nice surprises. On a recent trip there recently with friends, we enjoyed a super adult male Lapland Longspur at point blank range on the main trail. Our trip finishes overlooking Mott's Creek which over the years has been one of the more reliable sites for wintering Short-eared Owls. A couple of recent cancellations has left us with a few spare places, so if you want to be in on the fun, contact Chris Tonkinson at 609-861-0700 for registration details. Most of the messages of the last few days have involved the male Painted Bunting which continues today on Bayshore Road, just north of the Hidden Valley Riding Center. 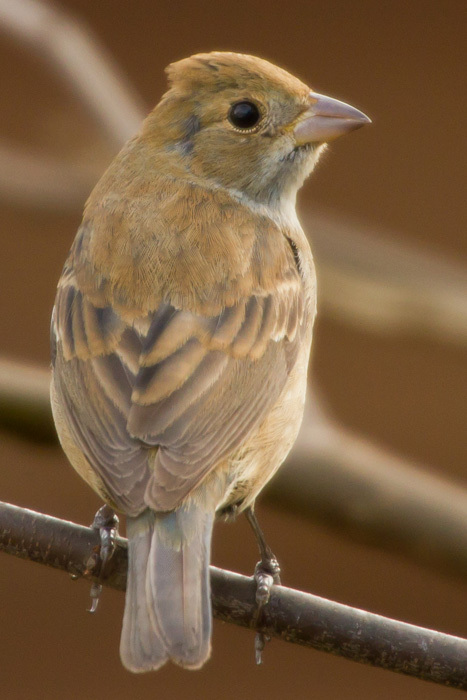 The Ash-throated Flycatcher continues today at Cape Island Preserve and at least one adult male Eurasian Wigeon is on Lighthouse Pond East with Blue-winged Teals. Baltimore Orioles continue to pop up in a variety of places (one is outside my Northwood Center window right now in fact!) and Jim Dowdell reported a very late Northern Waterthrush at the Cape Island Preserve today. The Avalon Seawatch continues to produce a trickle of Razorbills with Tom Reed reporting eight this morning. Yesterday, an unidentified whale species was close inshore off Townsend's Inlet but hasn't been reported yet today. 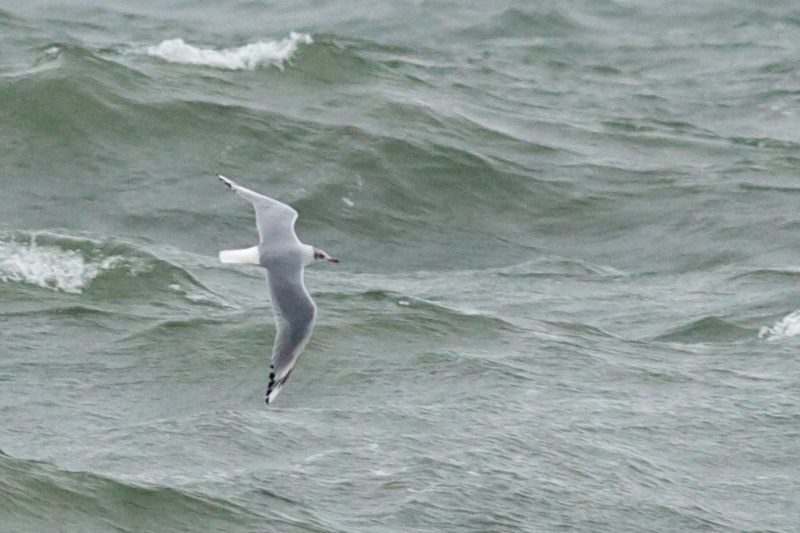 It was accompanied by three Parasitic Jaegers. Saturday December 3rd was a real day to remember in Cape May, with three major rarities and a strong supporting cast all south of the canal. 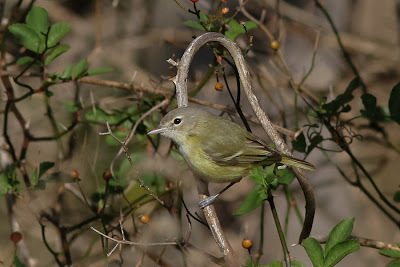 Top award for bird of the day goes to the Bell's Vireo that was at The Beanery near the parking lot for most of the day, last being seen around 4PM on the woodland edge at the north side of parking area, right beside Bayshore Road. 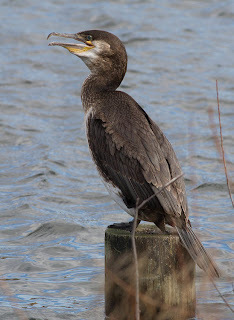 Unfortunately, though the bird was looked for today, it was not refound - though it may still be in the area of course. 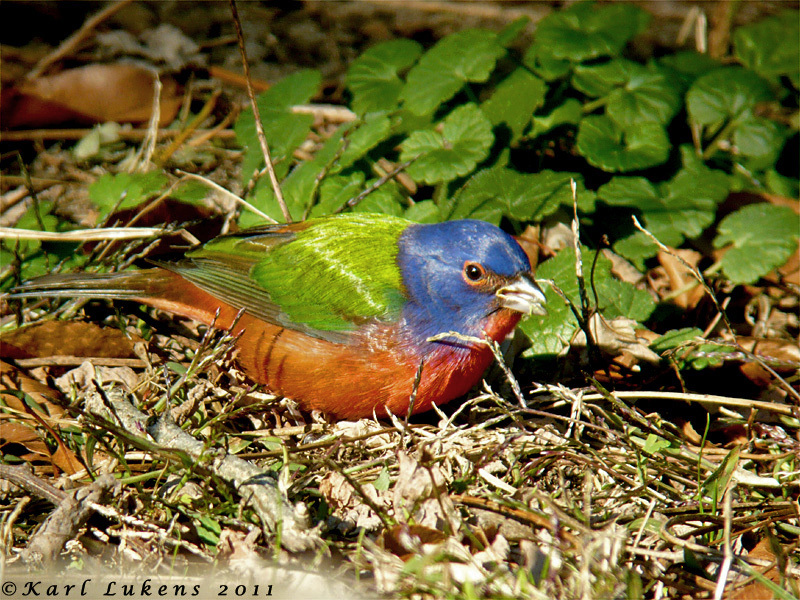 A mere 400 yards away from this bird, the stunning adult male Painted Bunting remained all day and showed well on and off at backyard feeders on Bayshore Road, just north of the entrance to the Hidden Valley Riding Center. Bronze medal of the day goes to the long-staying Ash-throated Flycatcher which, though elusive at times, remains relatively faithful to the south field at Cape Island Preserve off Wilson Street. Both the bunting and the flycatcher showed well today too. Other long-stayers around all weekend included the White-winged and three Eurasian Collared Doves at Cape May Point, up to three Eurasian Wigeon on Lighthouse Pond and at least one Cave Swallow still at the state park. 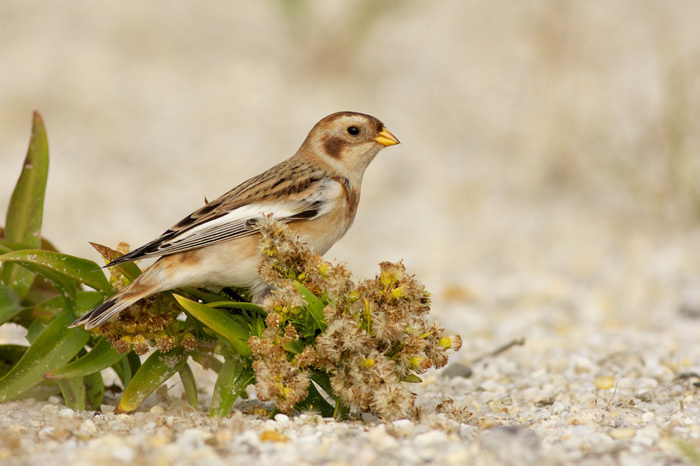 Vince Elia reported 40 Snow Buntings flying past Cape May Point this morning and at just after 4PM today, Tom Reed reported a first-winter Iceland Gull seen from the Avalon Seawatch as it headed into the gull roost at the south end of Sea Isle City. Some of us missed the vireo yesterday, but we were nevertheless enjoying ourselves on our annual early December Barnegat Bay trip for Harlequin Ducks. For pictures and to see how we got on click here. Hot news today involves the discovery of a stunning adult male Painted Bunting at private feeders along Bayshore Road, just north of the Hidden Valley Ranch turn. At least, I say hot news, as it transpires that the bird was first photographed by a curious home-owner on Monday! Such situations always help to put things in context and remind us that there must surely be an aweful lot of birds that escape the avid rarity-hunters eyes! 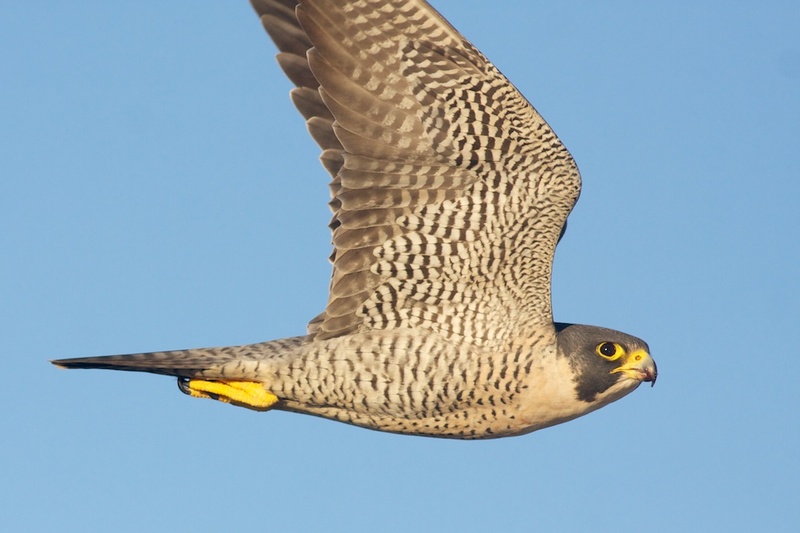 If you go looking for this bird over the weekend, please do respect the privacy of local home-owners and obey any on-site instructions. Always a stunner! 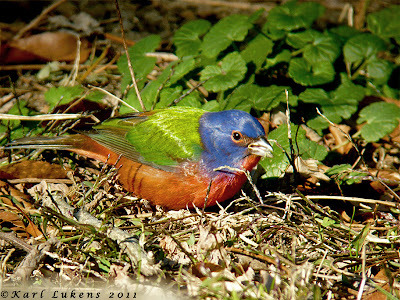 The adult male Painted Bunting on Bayshore Road today [photo by Karl Lukens]. 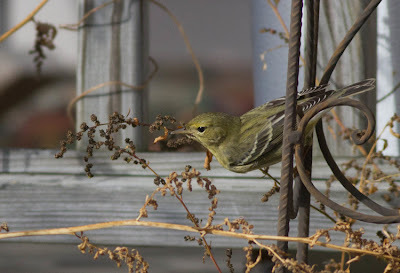 Other recent news involves a good run of birds at The Beanery - which included Yellow-breasted Chat, two Blackpoll Warblers, Lincoln's Sparrow, Orange-crowned Warbler and four Palm Warblers, followed by four Baltimore Orioles there today. 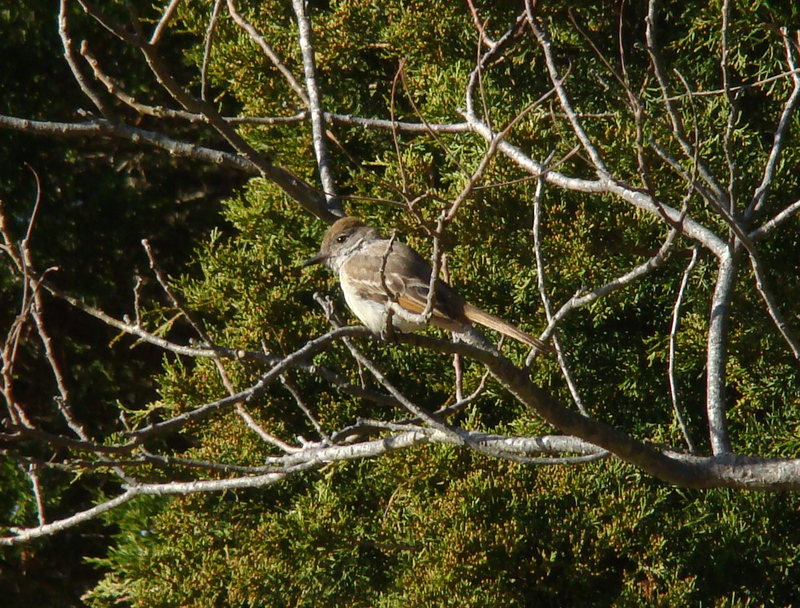 The Cape Island Preserve Ash-throated Flycatcher was last reported on November 30th but may still be worth looking for while the weather remains mild. 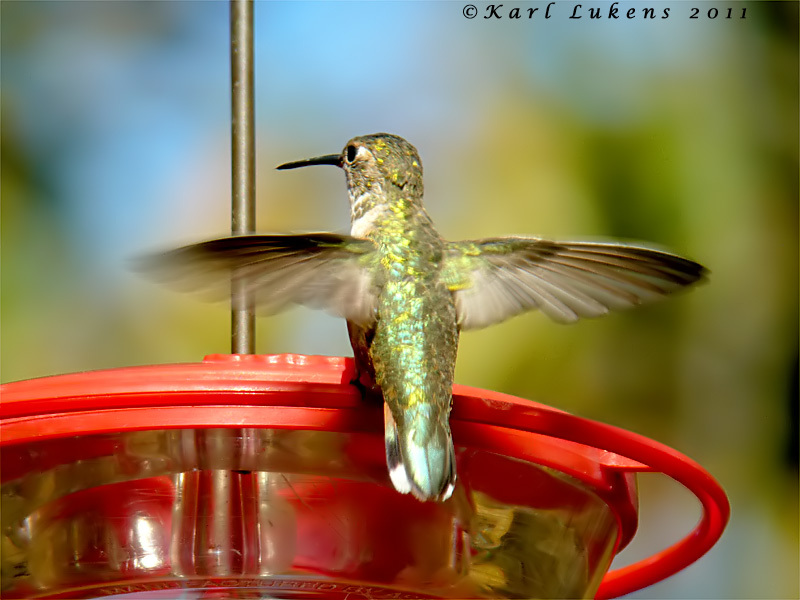 The Rufous Hummingbird was still at our Goshen store on route 47 on November 30th at least. The state park continues to provide good views of parties of Lesser Scaup along with the other expected species there, as well as up to four Eurasian Wigeon (two male/two female at various times) and a female Redhead. 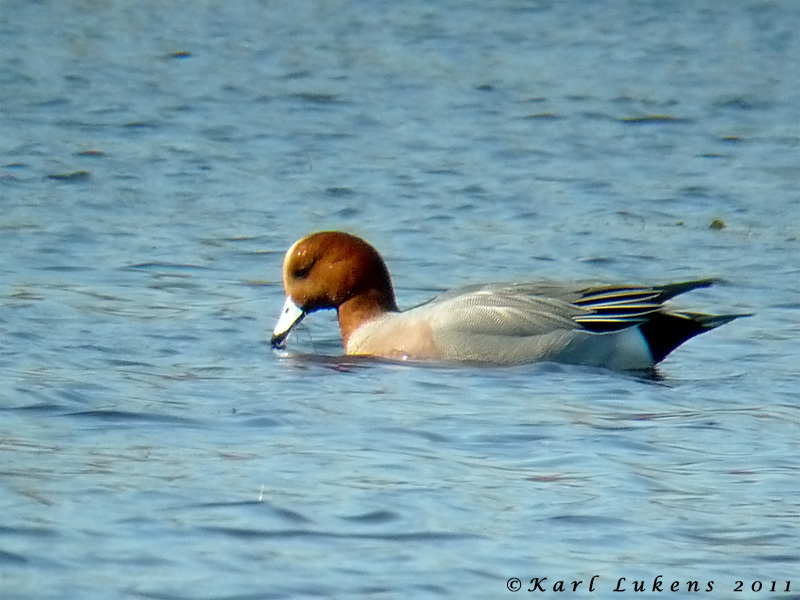 One Eurasian Wigeon was briefly reported from Lake Lily too. A single Barn Swallow was at the state park on November 30th and at least three Cave Swallows were there on December 1st with a handful of Tree Swallows. A Dickcissel was reported flying over Cape May Point by Sam Galick this morning and Chuck and MJ Slugg enjoyed three Red-headed Woodpeckers at Cox Hall Creek WMA today. These birds have been hanging there for a while now and seem to be best looked for pretty much in the very middle of the site. While raptor passage is pretty much over for the season now, a few birds still find there way down to the point and it was intriguing to see some 80 Turkey Vultures and five Black Vultures thermaling over the point today. Tom Reed continues to feed me little gems of information from the Avalon seawatch and sightings there today included two Red-necked Grebe, Harlequin Duck, King Eider and Razorbill. Further afield, it was nice to hear from Loralea Kirby at Egg Harbor Township, just outside our usual reporting area in Ocean County. Loralea had both Ruby-throated Hummingbird and a female Indigo Bunting in her yard on November 29th. 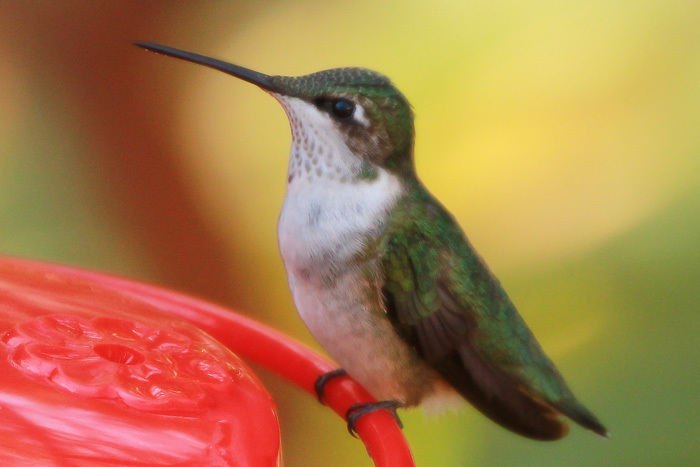 Ruby-throated Hummingbird at Egg Harbor Township [photo by Loralea Kirby]. Indigo Bunting at Egg Harbor Township on November 29th [photo by Loralea Kirby]. Will Kerling has done more than most in furthering our knowledge of butterflies around Cape May this year and has also been known to turn his hand to dragonflies and damselflies. Aware of published data on latest dates for various species, Will and I have both been looking at trying to set new latest dates for any species that may happen to be around. Being from the UK, the very act of looking for such insects in December is pretty weird to me but, with temperatures not exactly warm at around 50F today, we did check a few places in bright sunshine and little wind at lunchtime and we did set some records - or at least the insects did! Will Kerling and Sam Galick both independently recorded Sachems today, while I found a very tatty-looking Fiery Skipper in Bill and Eddie Schul's front yard (unbeknown to me at the time, Bill had already left me a message about this individual, as well as two Monarchs). As far as we are aware, these constitute the first records of any skipper species for December in New Jersey - though there will of course be people with notebooks from earlier years still waiting to be published!! Bring out your sightings and we'll turn them into records! Fiery Skipper at Cape May Point today [photo by Mike Crewe]. Male Rambur's Forktail at the Plover Pond on TNC property at the South Cape May Meadows, December 2nd [photo by Mike Crewe]. Male Familiar Bluet at the Plover Pond on TNC property at the South Cape May Meadows, December 2nd [photo by Mike Crewe]. Will Kerling also found one at Lighthouse Pond in Cape May Point State Park. Male Citrine Forktail at TNC's South Cape May Meadows, November 26th [photo by Mike Crewe]. This species still eludes us in December at the moment! It's always a sad day at Cape May. The first of December that is. Why? Because that is the first day since the end of August that you can go to the Hawkwatch Platform at Cape May Point State Park and see - well, no-one. I went down to the platform lunchtime under a chilly but sunny sky and was greeted by a telling sight. A car with Wisconsin plates, loaded to the brim with gear. This could mean only one thing - the last of our wonderful team of seasonal staff was heading out of town. All packed up and ready to go. The time to head out of town is here. 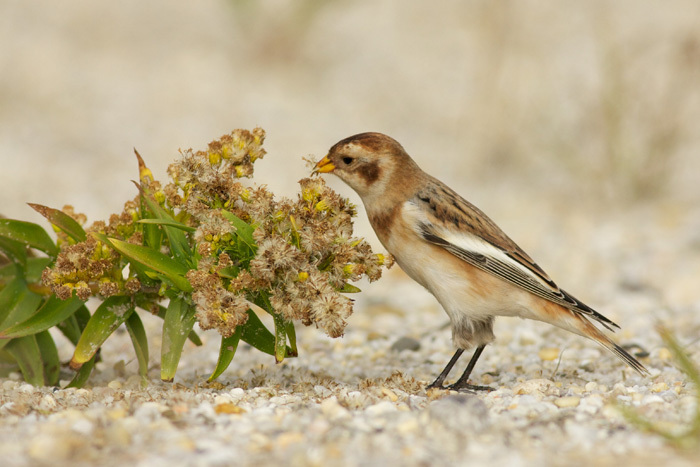 Long term projects such as the Cape May Hawkwatch and Avalon Seawatch form part of the very backbone of what Cape May Bird Observatory is all about. And none of this would be possible without the help and cooperation from our neighbors and sponsors. We thank the Cape May Point State Park and their staff for allowing us to operate the Hawkwatch within their boundaries and we especially thank our sponsors - this year Swarovski Optik - for their greatly appreciated support. It's not over for all of us though; don't forget that birding continues year-round at Cape May and you can bet we are looking forward to the forthcoming Chrsitmas Bird Count (give us a call if you want to help!) and the excitement of the winter season. See you in the field! !